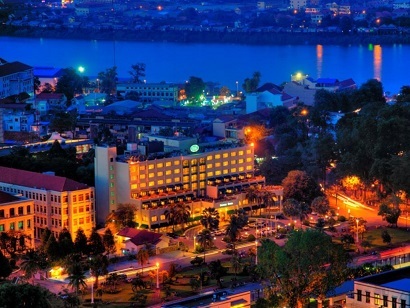 This 5-star hotel and entertainment complex is only 30 minutes from the Phnom Penh International Airport. Strategically situated in the heart of Cambodia�s capital, NagaWorld Hotel & Entertainment Complex is close to the Pencil Super Center, the Cambodia Amusement Park, as well as other governmental offices like the National Assembly and the Ministry of Foreign Affairs and International Cooperation. Showcasing an ancient Khmer style, the hotel�s interior and guestrooms are adorned with traditional motifs including the gracious stone-carved Apsara, a highly revered female angel in ancient Khmer mythology. The property�s on-site casino, located in a separate wing of the hotel, is complete with various gaming halls, live music, and first-rate service. InterContinental Hotels offers accommodation in the heart of Phnom Penh. It boasts an outdoor swimming pool lined with lounge chairs and a spa centre. Guests can enjoy meals from 4 dining options or a drink at the bar. Free WiFi is available in public areas. 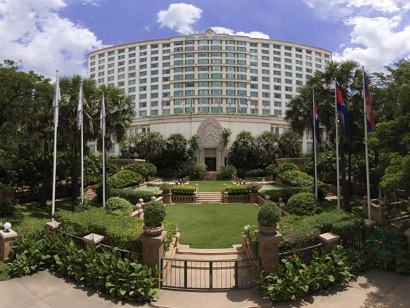 InterContinental Hotels & Resorts Phnom Penh is located 3 km from Wat Phnom, the Royal Palace and the Silver Pagoda. Sovanna Phum Khmer Art Association's Theatre is only 2 km away. Chaktomouk Conference Hall 2 is 4.6 km from InterContinental Phnom Penh. Phnom Penh International Airport is 8.4 km away. Airport transfers and shuttle services are available at additional charges. Featuring neutral and earthy tones, guestrooms are are fitted with large windows that open up to views. Rooms are equipped with flat-screen satellite TV, minibar and a desk. The en suite bathrooms include a bathtub, separate shower facilities and free toiletries. The 24-hour front desk can assist with currency exchange, tour arrangements, ticketing and concierge services. The business centre is also open 24 hours, where guests can arrange for indoor meetings, outdoor functions as well as banquet and secretarial services. Guests can work out at the state-of-the-art fitness centre. Alternatively, visit the sauna or spa centre. For meals, Regency Cafe offers varieties of local and international dishes. Enjoy authentic Cantonese dishes at Xiang Place restaurant or relax with a glass of your favourite drink and snack at Lobby Bar & Lounge. 24-hour room service is provided. Nestled within the heart of Phnom Penh, this exclusive boutique hotel sits in a peaceful residential area within close proximity to major tourist attractions including the royal palace and a myriad of restaurants and bars. Having recently been through a face lift, The Villa Paradiso now features traditional and classic architectural design. 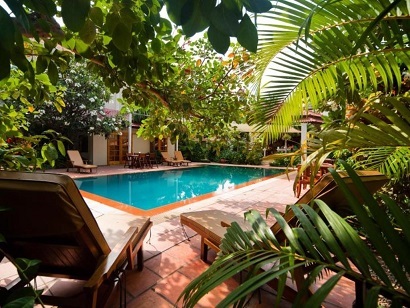 With charming Khmer-styled villas and up to date amenities, this 4-star property is set to impress. They also pamper guests by offering luxurious facilities like a spa with a Jacuzzi, detox session, and excellent opportunities for rejuvenation. 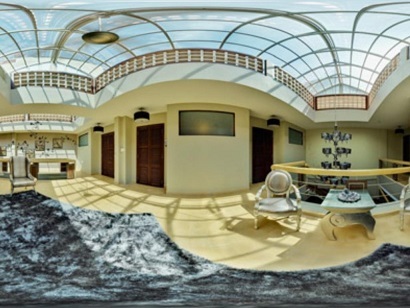 A flawless property, The Villa Paradiso is also famous for it's cordiality. 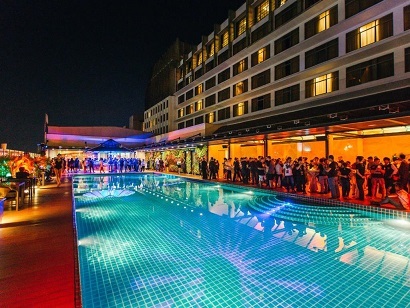 The Juliana Hotel is Phnom Penh's premier business and leisure resort hotel offering world class facilities in the heart of one of the world's most fascinating cities. An American breakfast and Thai, Chinese, Cambodian, and continental cuisine are all presented at the Vanda Restaurant on the ground floor. The Shark Fin Restaurant serves the finest Chinese cuisine including special shark fin soup. Facilities include a business center, car rental, convention facilities, and travel service. Juliana Hotel is a perfect venue for all travelers, ensuring a great and memorable trip. Conveniently located towards the north of the popular river, River 108 Hotel provides easy access to the entertainment and lively area known as The French Quarter. 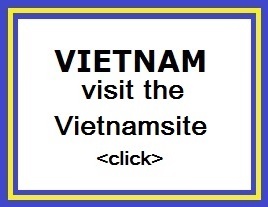 There is a variety of excellent dining venues and bars catering to international clients. It is just a stroll away from popular tourist attractions like Wat Phnom, Wat Ounalom, National Museum, Royal Palace, Phnom Penh Night Market, and Central Market. Boasting elegantly designed rooms, they offer a cozy environment and great hospitality to make your stay a great one. It also has beautiful furnishings and interior designs offering you a wonderful and comfortable stay with its modern facilities. Offering a perfect location and newly furnished rooms, it is a great choice of stay. 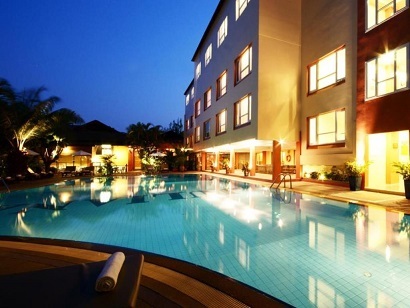 The Sunway Hotel Phnom Penh is convenient to everything Phnom Penh has to offer and is only 10km away from Phnom Penh International Airport. Guests will find all of the finest amenities in each of the 138 rooms in this popular 4-star hotel. Featured in each room, among other amenities, are a telephone, electronic/magnetic key, air conditioning, desk, and private safe. This property is wheelchair accessible, has morning call service, city transfers, a boutique, car rental services, a salon, and a travel counter. Guests may take advantage of sporting or leisure activities such as a sauna, massage treatments, steam room, fitness center, and spa at this hotel. With its commitment to service and focus on hospitality, you'll enjoy your stay at Sunway Hotel Phnom Penh. To continue with your reservation, please enter your arrival and departure date into our secure online form.